After good success of 7 inch Micromax Funbook tablet, Micromax Funbook Pro at price of Rs. 9,999 is available at online store now. 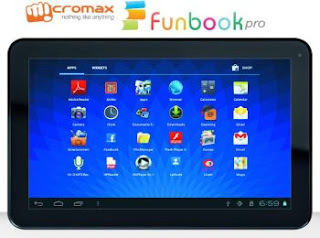 Micromax Funbook Pro price for retail stores which is also official price is Rs. 10,990. Micromax Funbook Pro price is higher by Rs. 3,500 (approx) from its Micromax Funbook price due to wider screen and other features. Micromax Funbook Pro features 10.1 inch screen and Cortex A8 1.2GHZ processor for high efficiency. Micromax Funbook Pro specifications include Android 4.03. Ice Cream sandwich operating system, 3G connectivity with dongle and VGA front facing camera. Micromax Funbook Pro price in this range is suitable for student and young professionals who wish to get tab in mid price range. Micromax Funbook Pro features 10.1 inch multi touch TFT LCD screen which has resolution of 1024x600 pixel to provide clear and very wide display of images, video and text content. Micromax Funbook Pro is powered with 1.2GHz processor along with 8GB internal memory and DDR3 1GB RAM which will ensure high speed smooth experience of heavy applications as well as multitasking. Micromax Funbook Pro specifications include from facing VGA camera for video chatting and 3G connectivity with Dongle which will give access to next generation services. Micromax Funbook Pro is loaded with Android 4.0.3 OS which provides intuitive user interface with better performance and compatible with Google Play to ensure users have more options for entertainment. It has FM radio, HD Video 2160P and HDMI Port V 1.4 to give unlimited entertainment on the go anywhere. Micromax Funbook Pro price and features makes one of the formidable tablet especially for educations and basic applications.